Over the next three weekends, the overnight sleeper from London which would normally run to Fort William will instead run to Oban — travelling out Friday night from London and returning from Oban on Sunday night. It is a rare experiment, but let's hope it might presage the reintroduction of regular overnight trains from London to Oban. Serco (that's the company which operates the overnight sleeper services from London to Scotland) has today announced that Friday evening's departures from London to Aberdeen, Inverness and Oban - originally scheduled from King's Cross at 9.20 pm - will now depart from Euston station in London at 8.18 pm. Passengers planning on taking the first night sleeper to Oban for over half a century TAKE NOTE: the train thus leaves earlier and from a different station from that shown on your tickets. The same applies to the 19 February direct service from London to Oban. Friday evening at King's Cross station in London is generally much the same. The end of a working week, and tired commuters are making their way home. There's probably not much romance on the 8.35 pm to Royston. But this Friday at King's Cross will be different. Overnight trains from King's Cross have been a rarity in recent years. The Caledonian Sleeper services to Scotland have normally run from Euston. But the repairs to the storm-damaged viaduct at Lamington (in the Scottish Borders) have played havoc with train schedules on the West Coast Main Line from Euston. So just now passengers using the overnight services to Aberdeen, Inverness and Fort William have the rare pleasure of leaving from King's Cross instead of Euston. King's Cross is so much nicer than Euston. It is a terminus which lends a sense of occasion to a long-distance train journey. We like grand departures. There is another change. Over the next three weekends, the overnight sleeper which would normally run to Fort William will instead run to Oban — travelling out Friday night from London and returning from Oban on Sunday night. It is a rare experiment, but let's hope it might presage the reintroduction of regular overnight trains from London to Oban. We quite fancy the idea of waking up as the train cruises down Glen Lochy towards Loch Awe. The last direct scheduled train service from London to Oban left Euston station on 24 September 1965. It was the last outing for the weekly overnighter to Oban, which left London every Friday evening. The returning train left Oban at 5.15 pm on Mondays, arriving back in London at breakfast time on Tuesday mornings. This Friday’s direct train to Oban leaves King’s Cross at 9.20 pm. This is not a train that rushes. The schedule allows two-and-a-quarter hours for the final sixty kilometres of the journey (from Tyndrum to Oban). That includes a 47-minute stop at Taynuilt by Loch Etive - more than enough time for passengers on the train to walk down and take a peek at the old charcoal-fired ironworks at Bonawe. From Taynuilt, the train will skim the south shore of Loch Etive before taking to the hills one last time, cutting through Glen Cruitten to reach Oban. The station at Oban is a simple affair, just two platforms handily sited by the quayside whence there are regular ferry departures to a number of Hebridean ports. The train from London is due to reach Oban just after ten in the morning. There are onward connections by ship to Lismore, Colonsay, Islay and Mull. The appeal of this unusual rail connection is immense. 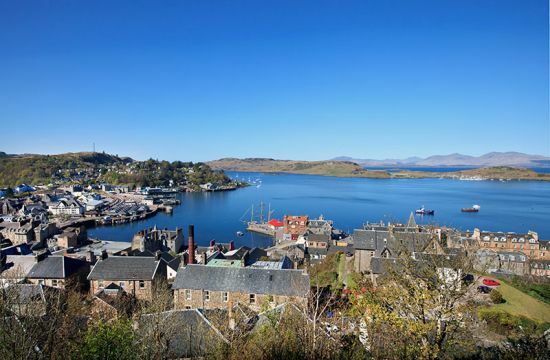 This Sunday, travellers from one of the remotest Hebridean islands, Barra, will be able to take the day boat to Oban, connecting there onto the direct overnight sleeper to London. Let's hope that the Oban sleeper becomes a regular fixture.